“The holiest of all mantras,” so described in Part II of Book Four, is from the obverse of the Stele of Revealing, shown at right. The hieroglyphs on the Stele read from right to left. The third glyph of the second line depicts a standing human figure with arm outstretched towards a feather. This glyph is the first of the series which comprise the mantra. It continues (right to left) through the first glyph of the third line (a horizontal zig-zag over three axes or flags). The study of ancient Egyptian language has advanced considerably since 1904 e.v. 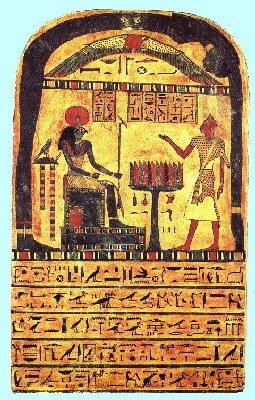 Some other treatments of the Stele text were published in The Holy Books of Thelema (Equinox III:9). When doing mantrayoga with The Holiest of All Mantras, I have found it useful to “compound” the mantra from its verbal-auditory and eidetic-visual manifestations. I.e. I will repeat the mantra a certain number of times while visualizing the first hieroglyph of the sequence, then repeat for the second, and so on. This melody has a sing-song quality that makes it suitable for repetitive chanting while sitting or walking, but it doesn't fit the drama of the Ceremony of the Opening of the Veil in the Gnostic Mass as well.